Feet in the water, in the mild climate of southern Brittany, the villa Saint-Gildas promises you unforgettable moments on the coast. With friends or family, you can enjoy the vast expanses of beaches of southern Morbihan and the tranquility of the large shaded garden. On a plot of 2000 m2, this large family home from the early twentieth century offers 5 bedrooms, including 3 doubles. The Noroît room has a panoramic view of the bay and has a private shower room. A second bathroom is located upstairs and one last on the ground floor. A large granite fireplace warms the living room which has beautiful exposed beams and strong oak doors. It is bathed in the grazing light of summer sunsets. The large modern kitchen is perfectly equipped. It is adjacent to the dining room, facing the garden, which will welcome guests in a warm atmosphere. Sheltered from the prevailing winds, under the trees, the large walled garden invites you to a sweet idleness. It is also a fabulous playground for children. 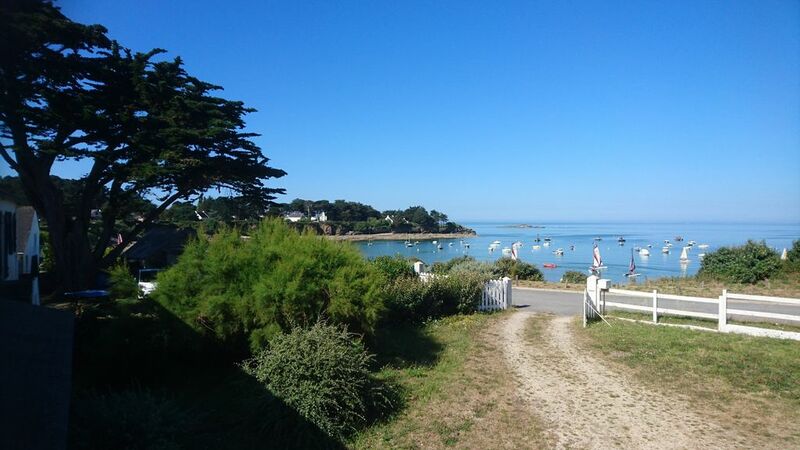 Close to the mouth of the Vilaine, the villa is directly on the beach of Poudrantais, close to the nautical club. The attic, the garage and the workshop are not available for rent.